In March of last year (2007) in Zimbabwe, we were notified of crop raiding elephant in the area of Gundaveroi. A local farmer was attempting to chase several elephant from his crops. In the farmer's endeavor to dissuade the intruders, he rankled the ire of a young bull, and then the farmer was himself, chased. In the ensuing skirmish, the ele chased the farmer for several minutes, but ultimately, the ele caught up with the farmer, and grabbed the man with his trunk. However, the ele was not yet finished... he was attempting to spear the farmer with his tusks, but was unable to do so because of the angle and position of the rocks where the farmer landed. During the ele's attempts, a six inch portion of his right tusk completely snapped off. ele evidently had sated his anger(or maybe had a toothache?) and ambled off into the night. When the onlookers were convinced the ele and all his co-harts had departed the area, they recovered the badly broken body of the hapless farmer. They then hauled him to the local medical facility. The farmer's fate was unknown to us when we arrived on scene. We could ascertain the events of the previous evening described to us by the onlookers. As we examined the rocky area where the farmer had been tossed, the piece of broken ele tusk was secured from within. We spent three days in the surrounding area, rooting around in the jesse attempting to locate the offending ele. However, our search came up empty. As far as I know, the ele with six inches of his right tusk missing, is still wandering around looking for a free meal. When next I return to Zim and am in the area of Gundaveroi, perhaps the ele with the jagged right tusk will still be plundering the locals' mealies and melons. If so, given the chance, I'll whack him. This action would be a small measure of redemption for the protein-starved local inhabitants who continually battle to grow enough to feed themselves... much less an eating machine such as "Loxodonta Africana"! 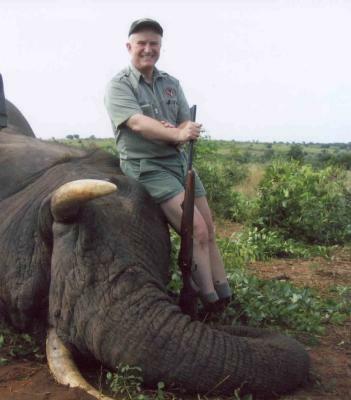 I believe this hunter has a wealth of African experience. I believe, with more effort, he could come up with an extraordinary story about Elephant hunting. This story did not have much of a hunt in it. Not enough detail for a good story. Could have been a lot better with more effort. JOHN HOWARD 'PONDORO' TAYLOR WOULD BE PROUD OF YOU. Put in this light can see no other solution.